Yet another visual reminder why I'm glad the Soviet system is behind us. Why couldn't they have left the "old" and built the "new" somewhere far down the river? So sad. These 2 views are very meaningful. The castle had been destroyed in the 1970s, under Brezhnev leadership. Close to the same area it was build that ugly Palace of the Soviet, a real monster never used after. The island in the middle of the river ("Kneiphof") before was completely occupied with ancient buildings and a net of roads. The Soviets destroyed all, except the Dom. On the destroyed area there were planted the trees and now it is a city park. May the communists be damned for the eternity, also because of this barbarity. P.S. It is a page with an Italian article. Do not mind. 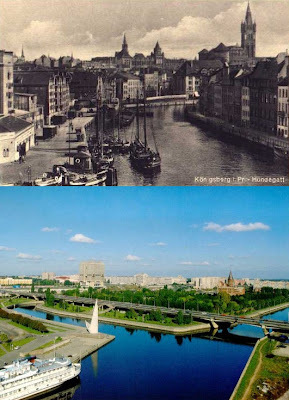 But at the end of the article there are the maps of Koenigsberg and of Kaliningrad each close to the other. Look at the differences. Hey, Rob, look at this entertaining blog! They are Russians wanting independence from Moscow and the ancient name.